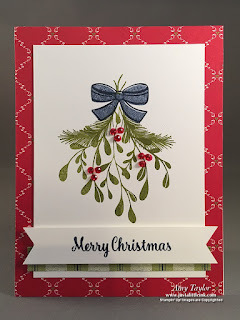 Just a Little Ink: Christmas In July! Oh, Yeah! This past Sunday, I held a Christmas In July class. Those who came made 8 cards, 2 each of 4 different designs. All mentioned how great it was, getting a jump start on their Christmas cards this early in the year! An almost direct CASE (copy and share everything) from the 2018-19 Catalog!